When you think of a cover-up tattoo, are you picturing bold lines, lots of dark shading, or even fully blacked out? Or maybe turning an existing tattoo into something “better-ish” because no matter how good your artist is, the old piece just can’t be hidden completely? 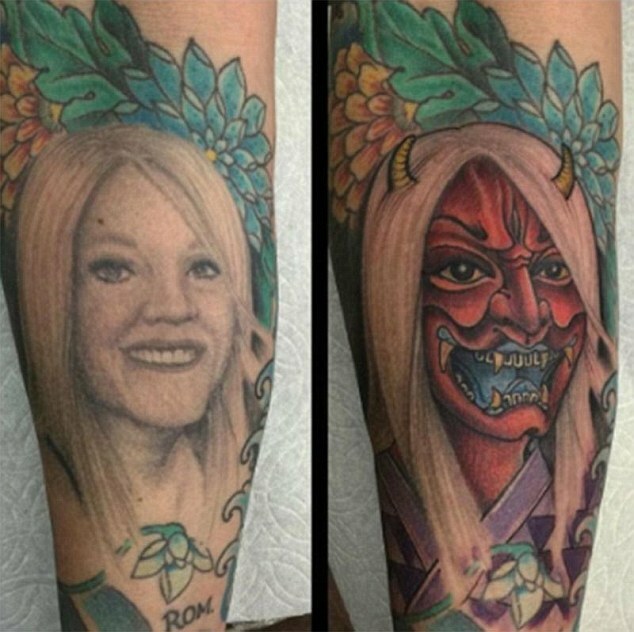 Fun cover-up work but she may have gotten the last laugh! When you lighten a tattoo, your artist will have more options when designing, outlining, shading, colors used - literally everything. Without lightening your existing tattoo, you’re kinda stuck picking from a group of new tattoos filled with very dark, heavy shading and thick, bold lines. Partial laser removal gives your artist the flexibility to use a wider palette of colors, leaves much more opportunity for shading rather than using solid sections of ink, opens up many more styles, and simply gives you more cover-up tattoo choices. Laser tattoo removal can help fade the areas that are hard to cover with new ink. If you’re thinking of working with existing ink, really consider your motivation for doing so. If you still like part of the tattoo, by all means, incorporate it. But if working around it just seems easier than covering it up, or it feels like your only option, it’s not! A few laser treatments will do wonders and open up a whole new set of options for you. The quality of your new tattoo will be that much better if your artist has more freedom. In the world of tattoos, an artist’s reputation is everything - it is their livelihood at stake here! Your tattooer wants you to walk out of their shop with the best cover-up possible. If you’re happy with the results, you’ll end up referring more people to the artist. If you ask your tattoo artist whether you should laser your ink before a cover-up, the answer will always be “yes”. They want to make you look good, and they want you to make them look good in return. Save money and do it right the first time!!! OK, OK, well if you read this far then that ship has already sailed, but you can still do it right the second time. Laser treatment can still help those who got coverups and aren’t happy with them (we do this all the time!) but the process is much slower and much more expensive in the end. Generally speaking, the more ink in the skin, the longer it takes to remove, and when one tattoo is placed right over another, there is going to be a LOT more ink in the skin, especially with how dark some coverups need to be done. Save yourself time, money and angst by doing it right the first time and lightening that tattoo BEFORE getting more ink on top of it! Long story less long, if you’re unhappy with existing ink but you still have the itch for more, laser treatment is the way to go. We’re also happy to talk with your artist and come up with a plan for the perfect coverup. Fading your ink for a cover-up tattoo is faster and costs less than full removal because it only takes a few sessions. Get in touch to set up a free consultation! We promise, your tattoo artist will thank you. © 2019 Evolution Laser Studio. All rights reserved.